What is your strength? – A must asked interview question which always gets a well prepared answer.. I’m a perfectionist.. I need everything in and around my life to be perfect.. A perfectly executed stream of life aligned with my perfect line of thinking..
Everything in life ought to be perfect.. A perfect partner, a perfect dog, a perfect job, a perfect lifestyle… A perfect everything.. But are we still 100% happy? No.. because we are still trying to perfect the little imperfect things in life.. I walked onto the first shop and saw a Buddha.. There he was.. a black granite one.. his closed eyes showering wisdom.. a sharp nose.. beautifully braided hair.. A sense of seeing him brought peace.. What not.. A complete beauty.. hand made.. I have never seen anything so beautiful in my life.. He was the perfect absolute sense of what I had in my mind.. But there was one flaw.. His posture was slightly slanted… Its something thats easily fixable.. I could just apply a wax base to it and my Buddha is all set to go..
told me to let go of this Buddha as I can get the perfect one (with absolutely no flaws) I imagined of.. I moved on to the next shop. Little did I know, that my search of Buddha was going to teach such a valuable leason in my life.. I walked to the next shop, the next and the next.. I found Buddha’s in white, green and grey.. Tall & short.. But not even one appealed to me.. Not even one had the eyes I needed.. Not even one had the nose I needed.. Not even one had the presence that my Buddha was supposed to have.. I walked and walked.. I went to the next 30 shops (Yes! I went to every single shop in the whole tourist spot in search of my perfect Buddha).. Well.. Needless to say, I did not find any.. I was so attracted by the purity of the Buddha I missed.. I could not let go of him.. 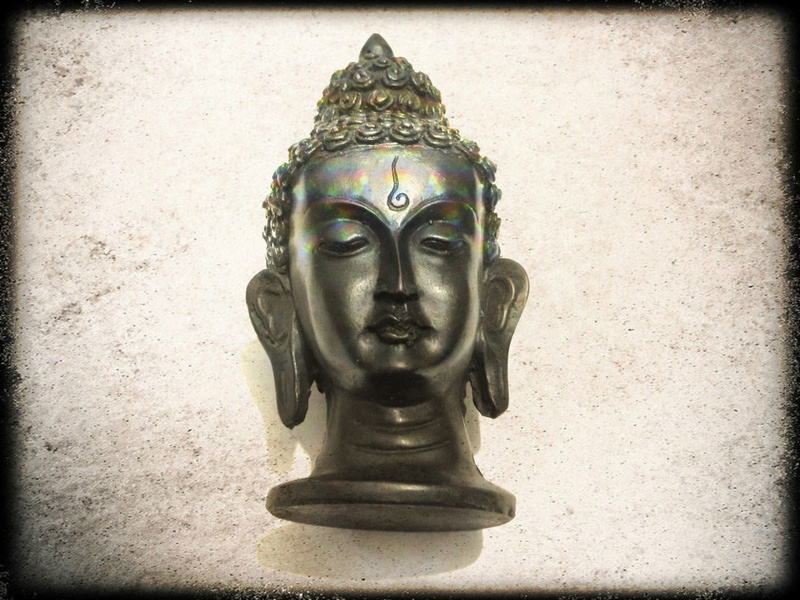 I walked again a mile to the old shop to get the Buddha which I believed it belonged to me.. I went there feeling a bit ashamed.. Feeling a bit unesasy.. But I needed this Buddha statue so badly.. I decided to act like a first time visitor to the shop and asked him how much the Buddha costed.. The old wise man knew it was me.. He gave me a smile.. A smile with so much of pride in his art work, a smile that tossed all my pride away..
A smile.. Just a smile.. Nothing more.. Nothing less..
Its been 6-7 months since this incident had happened.. But till date, when ever I see my Buddha statue.. I see him smiling at me.. I see him telling me to appreciate the non-sensical, non-logical beauty behind everything in life..
PS: Wabi-sabi is a Japanese philosophy that embraces the beauty of things that are imperfect and incomplete. ← Happiness in the air! Super ponga.. I liked this one.. Beauty is in the eye of the beholder! Good ashwini. Its true everything is what we see.keep going .Hope to read more. Let me see whether u can recognise me. Thanks a lot mam.. 🙂 How are you? Long long time.. It’s so great to see you here..